RFF829M was the final appliance to be delivered and placed on the run in the former Meirionethshire Fire Service. Allocated to Barmouth alongside Bedford TJ4/HCB-Angus CFF521C she replaced a Bedford SB/HCB WrT BFF 117 of 1953 vintage which was reallocated to Dolgellau. CFF521C was reregistered in 1988 to DEY386C due to a clerical error between Caernarfon and Bangor. RFF829M is seen hereat the side of Bangor Fire Station on 14/2/85 bereft of insigna and embelishments plus her engine. 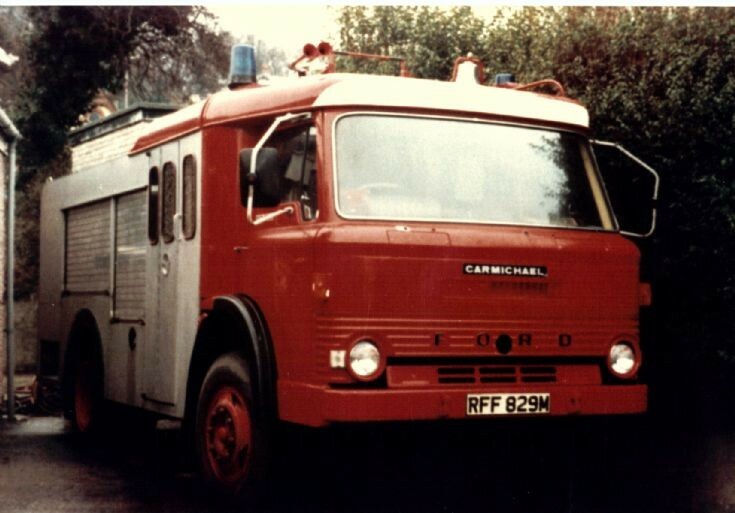 When Barmouth recieved WEY327V in 1980, RFF was then transferred to Blaenau Ffestiniog replacing Bedford SB/HCB DFF 112. Added by Andrew Middleton on 10 July 2010. I think I have seen a photo of Blaenau running a Commer c1980? Added by Neal Glover on 11 July 2010. Do you know when this was delivered? I ask because the 809 designation describes an 8 ton GVW chassis with a 90 BHP engine. This was not one of the SVO fire appliance chassis offered by Ford; these were all 10, 11, 13 or 16 tons, with either 140 BHP turbo six cylinder Ford or 170 BHP Perkins V8 engines. The V8 was the same engine as used by Dennis, Dodge, ERF and S&D at the time. Added by Rob Johnson on 06 June 2018.